It’s official. Boot season is upon us. What better way to keep the tootsies warm and rock skirts and dresses all winter long. I took a post-call walk Monday morning in my new knee high black leather boots. After having worked 126 clinical hours in 8 days, I still felt a little guilty taking time to walk my 6 year old son to school yesterday after returning home to freshen up before heading back into work. (More on working-mom guilt in a later blog.) It was a chilly morning; but, I decided to walk him to school so that I could curl my fingers–now dry and raw from alcohol cleansing patient after patient, day after day–around his still so soft and smooth little hands while also having my first conversation with him in over a week. It was also the perfect time to sneak in a few extra steps (10,000 steps/day remained elusive despite being exhausted from being on-service) and to break in the boots. As I thought to myself “Wow these boots really are comfortable and look soooooooo good!” my son asked, in that way as if he were asking why the sky is blue, “Mommy, why are your calves so fat?” Way to keep it real little guy. Thanks! The battle between my calves and the elusive knee high black boots has been epic. I know it isn’t nearly as existential as I have made it out to be in my head. Clearly something about my gait has left me with dainty ankles and well-developed (not fat son, not fat!) calves. As a result most knee high boots will simply not zip or otherwise allow themselves to be pulled up to my calves. Those that do typically create what can best be described as a muffin-calf or equally unflattering cankles. I have spent over a decade trying to find a pair of boots that both flatter the ankle and fully envelop the calves (by whatever mechanism necessary). I tried entry level brands and high end brands. I tried comfort oriented styles and fashion styles. I tried ankle zips and full zips (along the inside, the outside, and up the back) and stretchy panels (full panels, partial panels, and dual panels). I tried leather and suede and (gasp: sorry PETA friends, I just love a good smooth-as-a-baby’s-bottom calfskin) even tried synthetic. The boots won and I lost, relegated to bare calves or wearing long pants all boot season long. My poor husband, followed by our children, sat through countless hours of me and my calves battling boots in shoe stores or department stores. I would order multiple pairs at a time from on-line retailers only to be disappointed and take advantage of their consumer friendly return policies (thanks, Tony Hsieh). I would take boots to the local cobbler begging him to stretch a boot shaft just a little bit more or stitch a cankle into an ankle. It got to the point where I would look for shoes on every trip I took just in case a far away retailer had an elusive boot that was somehow not available locally. Jimmy Choo Dyotts circa fall 2011. May they rest in peace. I thought I had finally succeeded two years ago with Jimmy Choo’s Dyott. But, it turned out that the Dyott’s left zipper was no match for my left calf (which, of course, is slightly more well-developed than my right). And so, my hunt continued late into last year’s boot season (found a pair of Stuart Weitzman’s Accumulate that worked with minimal cankling–my go to weekend casual boots), over the summer (when I snagged the very last pair of Christian Louboutin Bourge in the US while vacationing in the Bay area–my party boots), and as recently as last week when my little guy sat with me (again) as I tackled nearly every professionally appropriate tall black boot to be found at Nordstrom (their shoe return policy is the best in the business and my calves demand such a policy) lamenting my calf woes only to end up with a pair of stylish and practical boots for work (Anyi Lu Viktoria) that it turns out are the ideal boots for walking my son to school and chatting about my fatness of my calves or the blueness of the sky. Mother-son bonding couldn’t be any better. This entry was posted in Family, Fashion, Parenting, Shoes, Work Life Balance and tagged Anyi Lu, Christian Louboutin, Jimmy Choo, Nordstrom, Stuart Weitzman, Tony Hsieh by surgeoninheels. Bookmark the permalink. Actually, you can stretch boots fairly easily using a boot stretch spray, boot stretching tools like a calf stretcher, and by just using boot leather conditioner. You’ll need liberal amounts of boot stretch spray (get a 20 oz container) and it might take a few months, but you’ll have a favorite pair that fits you and you can wear them for years. I’ve done this with about a half dozen pairs of cowboy boots and they fit great and I wear them all the time. 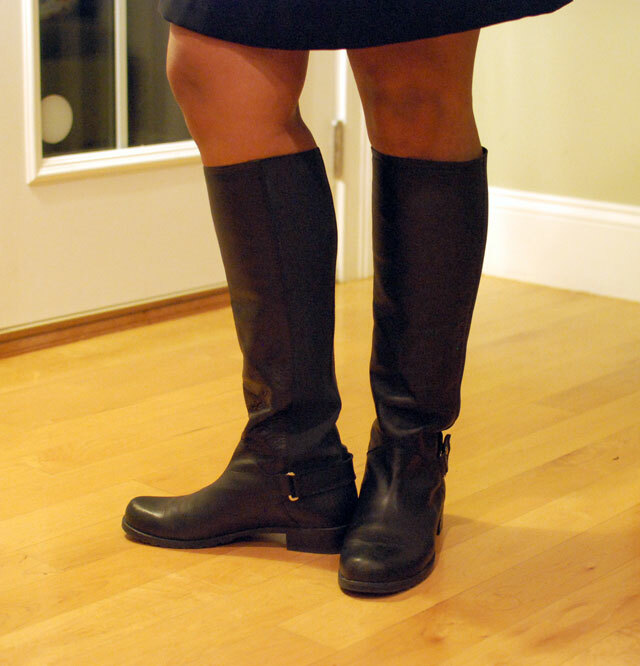 With the thinner leather on women’s dress boots it might be even easier (but use a lot of the spray). Good luck!